There can be a lot of questions when we introduce a person to looseleaf tea—even some anxiety. How do I brew this correctly at home? is a common one. What if I don’t have the same teaware as you’re using? is another. At times, would-be tea drinkers can even be conditioned (probably by someone with something to sell) with the fear that they’re going to ruin a perfectly fine cup of tea unless they invest in the right equipment and use it just so. Of course, we sell teaware too, and if you’re looking for a teapot or other tea tools, we hope to provide you with them. But it’s crucial for all tea drinkers to understand there is no single best tea brewing method or best teapot. There’s only the best teaware for you. It doesn’t need to be fancy or elaborate, and it shouldn’t send you into a panic spiral; it just needs to produce a cup of tea that you enjoy. With that in mind, here are our tips on appropriate setups for various brewing situations. If you’re new to looseleaf, you may want to first read this detailed guide on how to make tea. But even if you’re an experienced drinker, there are some important principles to consider when shopping for teaware. You could have access to the purest mountain spring water and a cabinet full of antique Chinese clay pots, but none of that matters unless you start with quality tea. Dollar for dollar, nothing improves your tea-drinking experience more, and while you can make tasty tea with nice leaves and middling teaware, the inverse is rarely true. Once immersed in water, looseleaf teas can unfurl to several times their dried volume, and the leaves need that room for water to circulate fully and extract all their soluble flavor compounds. Tiny tea balls, spherical mesh scoops or narrow infusion sticks don’t give tea leaves enough space to open, which often leads to a weak or flat-tasting cup. No matter which tea vessel you use, take the time to warm it first. Most teas perform best with a certain range of temperatures: Many, like oolong, black, and pu-erh prefer water right off the boil; others, such as green and white teas, taste more balanced with the water a bit cooler (160°-180°F). But these temperature guidelines don’t account for the heat sucked out of the water and into the teapot during brewing. We’ll spare you the scientific details, but pouring boiling water into an unheated ceramic or glass mug can drop the temperature by 10°F or more—before your tea even starts brewing. Thin-walled teaware, such as this porcelain gaiwan, can heat up with boiling water sitting in it for several seconds. Thicker ceramics like these cafe teapots can retain heat longer—which is useful for large volumes of liquid and long steeping times—but they also require closer to a minute to fully preheat. If you’re just getting started with looseleaf tea, or are looking for a convenient and discreet way to drink your prized brews at the office, all you need is a mug and an infuser basket. We carry two versions: a lightweight gold mesh basket, and a sturdy stainless steel and lid combo. Both infusers fit into most regular mugs and teapots, and offer plenty of room for leaves to expand. The metal won’t impart any flavor to the brew, and as long as you don’t keep spent tea leaves sitting in them for hours, the baskets can be cleaned easily with a rinse of warm water. You can even use an infuser as you would a gaiwan or small clay teapot for gongfu-style brewing (more details on that below): just start with a generous amount of leaf, and remove the basket following a quick infusion time. This method enables the same leaves to be re-infused multiple times, with a corresponding arc of flavor and fragrance in each cup. This is the standard Western style of brewing tea you probably already know: a few teaspoons of leaves in a pot that holds at least 8 ounces of water. It’s a fine way to brew Indian and many Chinese black teas, green teas and white teas of all kinds, as well as herbal infusions. Beyond a pot that retains heat well and pours without dripping, look for one with a large, removable infuser basket (which will enable you to control the strength by removing it), or just toss the loose leaves in the pot itself and be prepared to decant the entire amount when the tea is to your liking. High-quality looseleaf tea can be steeped at least twice; by removing the infuser or not letting the leaves linger in the water between servings, you can get the most from your tea while preventing the flavor from becoming oversteeped and bitter. Many of our restaurant customers enjoy the ceramic cafe teapots, which hold enough liquid for two to three servings of tea, have thick walls which stay hot during long steeps, and feature a fine stainless steel infuser basket. They’re also stackable, which is useful for storage. For a more elegant presentation, we love the sleek glass Mono pots, which have an enormous brew basket for maximum circulation. Once it’s removed, the tea practically glows through the glass. One more thing about large pot brewing: Even if you’re planning on drinking a lot of tea, we recommend consuming it out of a not-so-large cup. A giant mug will start piping hot, but by the time you get down to the bottom, your tea will have cooled to lukewarm. Smaller cups—in the 4- to 6-ounce range—will let you drink more of your tea at an ideal serving temperature. 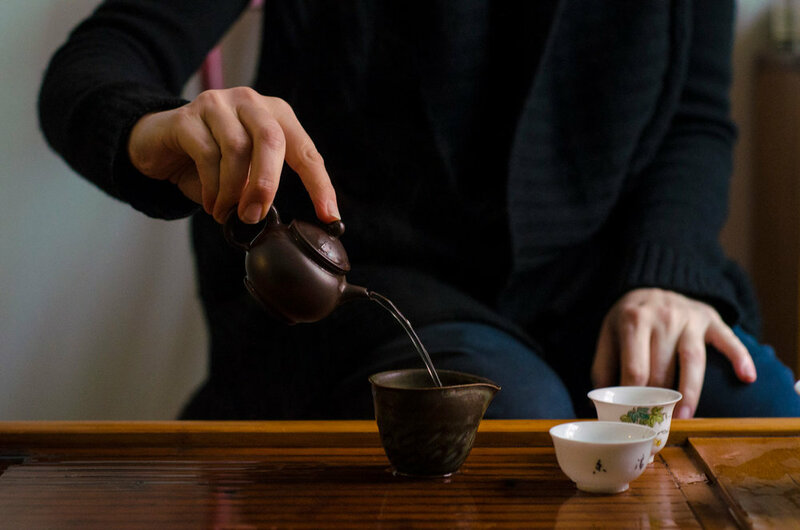 Over the past couple of hundred years, many Chinese tea specialists have developed a range of brewing practices that can be collectively described as gongfu cha, or making tea with skill. Its foundation is using practical measures and skillful technique to draw the best characteristics out of looseleaf tea. The general concept is a high ratio of leaves to water used in a series of brief infusions, which delivers concentrated doses of flavor that evolve in character from steep to steep. It’s particularly suited to oolong and pu-erh teas that can be infused many times, but you can use it for any looseleaf tea, from sencha to Darjeeling. We certainly do in our tasting room. This method does involve more advanced teaware. The brewing vessel is much smaller than typical Western styles—usually just 2 to 4 ounces—so that you can enjoy several successive steepings before filling up. The cups are proportionately sized, about an ounce or less, to highlight the concentrated amount of liquid. A sharing or fairness pitcher is common for decanting; the brew is poured from the pot or gaiwan into the pitcher, then from the pitcher into each cup. This ensures everyone’s tea is the same strength—nice and fair. Certain traditions also employ accessories like a slotted tea tray to collect rinse water, tongs for handling hot cups after rinsing with boiling water, and presentation vessels to show off the leaves before infusing. These are nice pieces to have if you enjoy those parts of the process, but can be considered optional. As much as we love fine traditional teaware, we also love adapting whatever’s on hand to gongfu cha. Shot glasses can double as tasting cups; your coffee creamer is probably a perfect fairness pitcher. Small pot brewing involves some technique, but the tools themselves do not need to be intricate. The most essential tool, of course, is the brewing vessel itself, and there’s no better place to start than with a simple but universal porcelain gaiwan. This lidded cup allows you to sip straight from it, as some old timers do, or to use the lid as a filter to hold back the leaves when decanting into a pitcher or cups. Meanwhile, the bowl’s wide shape allows the leaves to freely circulate while the fluted edge stays cool, enabling one to comfortably grasp the rim and pour. Porcelain works with all kinds of tea and is particularly good at trapping fragrances that emanate from the leaf; the lid and bowl can each present unique aromatics. You can also find glass and stoneware gaiwans, which each have their aesthetic value. Heat-resistant glass is a nice choice for lower-water-temperature green teas, while weightier heat-retaining stoneware styles work well with darker teas. Yixing pots sit at the peak of the teaware mountain. They are small, thin, unglazed teapots designed for gongfu cha, and range from simple mold-made forms to million-dollar collector’s items. The term yixing itself refers to a city in China’s Jiangsu Province, a historic pottery site with particularly prized veins of clay. Some people in the West, however, refer to any unglazed Chinese or Taiwanese teapot as “yixing.” To make things more complicated, there are several sub-varieties of clays from Yixing, and each can be shaped and fired in multiple ways to varying results. Not to mention many pots sold as yixing clay are made with clay from other regions, and even experts can have trouble spotting the difference. Why all the fuss? While a glazed porcelain gaiwan can deliver a clean representation of a tea’s character, quality yixing pots can make certain teas sing. There are lots of reasons why, including the structural advantages of dense, heat-retentive clay and how the physical shape of the pot interacts with tea leaves, but the most celebrated is the effect of mineral-rich clay on a tea’s flavor and texture. If you’ve ever eaten beans cooked in a Latin American pot, you may have picked up on a certain rich, earthy sweetness; quality yixing and similar clay can have a softening or sweetening quality on infused tea. This is not to say that yixing pots are always the best. Many delicate, aromatic teas can become muted in unglazed pots, and minute differences in the clay’s composition, firing temperature, firing method, and even a potter’s personal style can all impact a given tea for better or worse. It’s often said that “the pot chooses the tea,” namely that despite our best intentions, certain teapots harmonize more with certain types of tea than others. And you might not even like the result that interaction has on the brew! Think of a yixing pot like a fine chef’s knife: You have to pick one that feels right to you. Once you do, it’s a partnership for life. Because the pots are porous, they will slowly absorb oils and other compounds from teas brewed inside, and over years they can develop a handsome patina that reflects your personal brewing history. Some tea drinkers feel this patina is what gives yixing pots their tea-altering power, as the clay summons the essence of teas past to flavor a new infusion. Take that claim with several grains of salt as the science on the topic is murky at best, but do let personal experience be your guide. Since the pot can pick the tea, it’s advisable to not mix and match teas too much in a yixing. 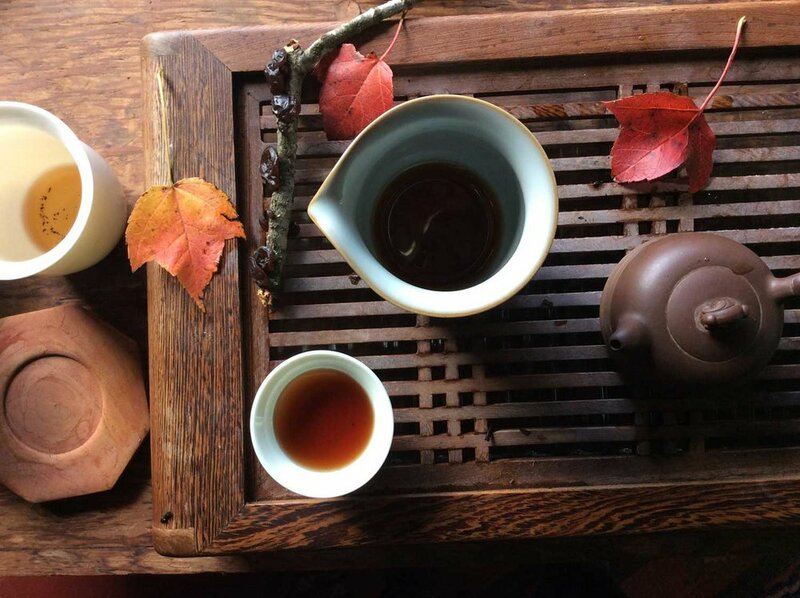 Namely, a pot that you predominantly use for Wuyi oolong probably won’t do a green tea any favors. But again, it’s your pot, and short of dropping it on a tile floor there are few ways to ruin it. Many traditional drinkers will use the same pot for several kinds of tea; others are far more specific. Don’t worry too much—a pot’s patina takes years to build up, and some mixing of teas won’t harm that process. We are proud to carry two lines of unglazed clay pots: true yixing clay, hand-crafted and acquired from a trusted collector in Hong Kong; and these glossy Taiwanese clay pots, made by a long-time friend and artist on the island. Either will produce great results with a range of oolong and pu-erh teas, giving you ample room to experiment. To keep your pots in prime condition, rinse them well before using to free up any residual sand or clay particles. Some like to season their pots by submerging them in hot water or strong brewed tea; others just start brewing right away. The choice is up to you. Always only wash the pots with water, not soap, and let them dry completely (with the lid off) between uses to prevent any mold growth. If you follow those simple guidelines, you’ll raise your yixing into an heirloom your grandkids will fight over—and drink some great tea in the meantime.